Not to worry, we thought. We’ll publish in the UK in October and worldwide in December. Which is what we are doing. The remarkable thing, in this global village in which we live, is that thanks to the services of The Book Depository, a book published in the UK is available worldwide – and with free delivery too. We’re even more impressed with The Book Depository than we are with Amazon. First there’s the free worldwide delivery thing. We sent a copy of Of Honest Fame to someone in Australia on publication day – the postage cost was around 60% of the book’s cover price. Whatever The Book Depository is doing to offer free delivery, we’re impressed – because they’re not (unlike some online retailers we could name) demanding an unreasonable discount from the independent publisher – which means a fairer deal for the author, too. Then there’s their excellent (in our experience, as both customers and suppliers) customer service. And then there’s the fact that you can pay for your books in sterling, euros, or US, Canadian or Australian dollars. That last touch is particularly masterful – make it as locally friendly as possible. Why should you Aussies and Canadians have to worry about exchange rates? Book Depository, we salute you as exemplifying the acceptable face of the global economy. We’re looking forward to seeing as many of you as can make it to tomorrow’s launch of Of Honest Fame in Winchester. Join us at P & G Wells Bookshop for a 7.30 start. Here’s a map for those who need it. On-street parking is extremely limited on College Street, but you could try Symonds Street or The Square, or the car park in Colebrook Street. Join us at the marvellous P & G Wells Bookshop in Winchester on Thursday 14th October at 7.30 pm, for the launch of M.M. Bennetts’s gripping new novel Of Honest Fame, set at the height of the war against Napoleon. To whet your appetite, you can read the opening online. And there’s still time to enter our Last Word competition for a signed copy of the book. Stop Press: There’s now another launch event in London on 21st October. On a summer night in 1812, a boy sets fire to a house in Paris before escaping over the rooftops. Carrying vital intelligence about Napoleon’s Russian campaign, he heads for England. But landing in Kent, he is beaten almost to death. The Foreign Secretary, Lord Castlereagh, is desperate for the boy’s information. He is even more desperate, however, to track down the boy’s assailant – a sadistic French agent who knows far too much about Castlereagh’s intelligence network. Captain George Shuster is a veteran of the Peninsula, an aide-de-camp to Wellington, now recalled from the continent and struggling to adjust to civilian life. Thomas Jesuadon is a dissolute, living on the fringes of society, but with an unrivalled knowledge of the seamy underside of the capital. Setting out to trace the boy’s attacker, they journey from the slums of London to the Scottish coast, following a trail of havoc, betrayal, official incompetence and murder. It takes an unlikely encounter with a frightened young woman to give them the breakthrough that will turn the hunter into the hunted. Meanwhile, the boy travels the breadth of Europe in the wake of the Grande Armée, witnessing at first hand the ruination they leave behind and the awful price of Napoleon’s ambition. This companion to M.M. 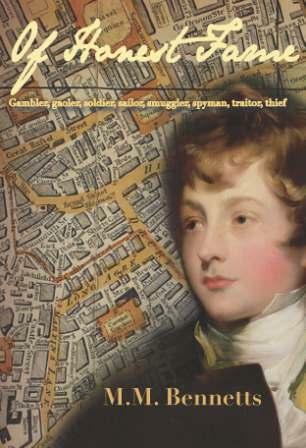 Bennetts’s brilliant debut, May 1812, is a gripping account of deception, daring and determination, of intelligence and guile pitted against brutality. Bennetts brings to vivid life the harrowing devastation wrought on the civilian populations of Europe by Napoleon’s men, and the grit, courage and tenacity of those who stood against them. Of Honest Fame will be published in hardback in the UK in October 2010, and worldwide in paperback and e-book formats in December 2010. You can read the opening chapter and pre-order a signed copy on the Diiarts website. Diiarts is delighted to announce the publication of M.M. Bennetts’s gripping new novel, Of Honest Fame, in October 2010. You can read the opening here, and you can pre-order your signed copy on the Diiarts site. This article appeared on the Telegraph website today and sums up one, at least, of the reasons we’ve established Diiarts. Someone, somewhere, in the world of publishing needs to stand up for standards. Someone has to produce books for people who love books. I’d like to think that Ms. LaPlante would approve both of our motive in founding Diiarts, and of our first four titles. I am indebted to Chris Patten, Lord Patten of Barnes, whose book “East and West” includes the superb word “lobotomocracy”. He used it in a different context, of course, but I’ve now adopted it in my own vocabulary in place of the somewhat paler “celebritocracy”. Readers – if you enjoy celebrity fiction, chances are that our books may not be for you. If, on the other hand, you want something with which to curl up by the fire, something into which to get your teeth, click here.